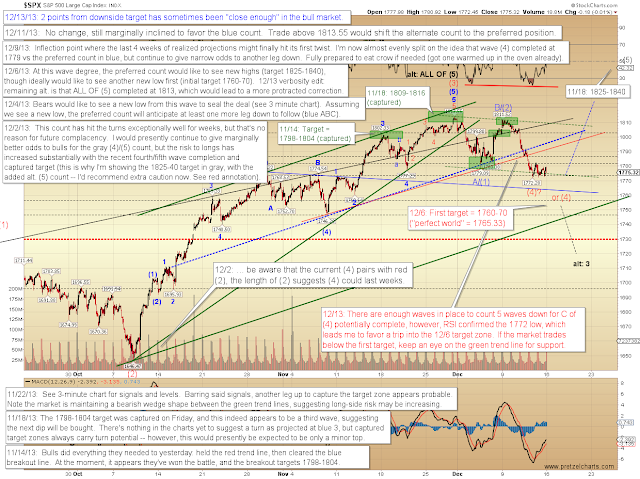 Pretzel Logic's Market Charts and Analysis: SPX Update: Is Santa Coming to the Market Soon? 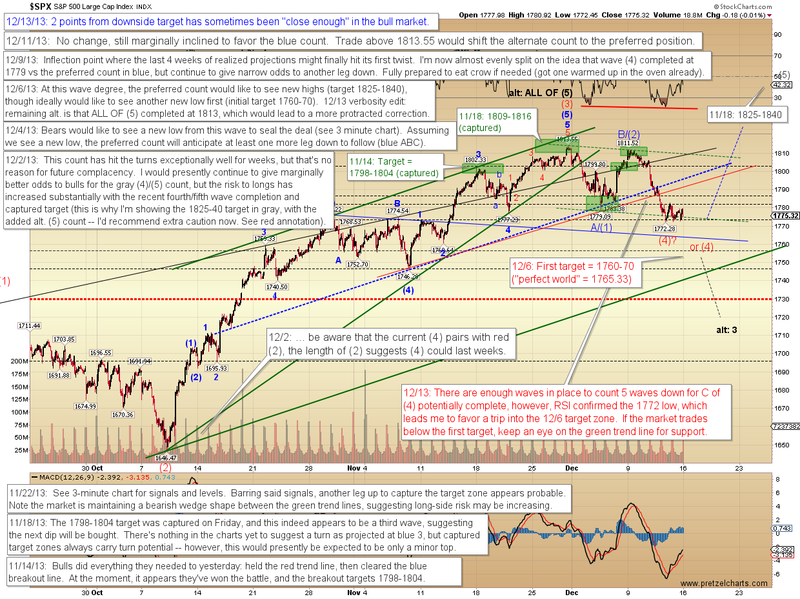 SPX Update: Is Santa Coming to the Market Soon? Friday's action remained within a tight range, which added little information to that day's pre-open update. Interestingly, on Sunday, E-mini S&P futures (ES) had a wild night and thrust down into the cash target zone, before recovering in a parabolic fashion, as the futures market was struck with a sudden buying panic. Since futures reached the target zone, this adds some flavor to the option discussed on Friday that the cash market could have completed wave C of (4) down at 1772 -- though I'm still not entirely sold on that idea. 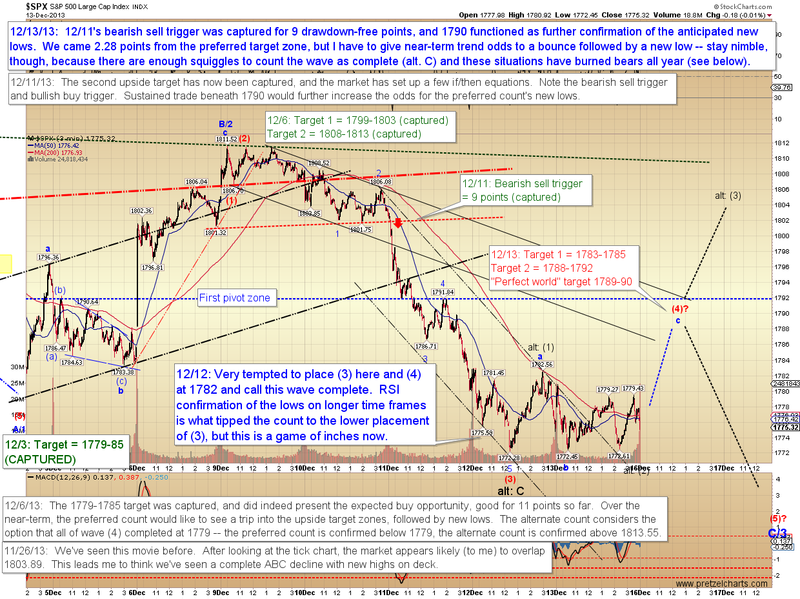 My standing target for this wave has been 1760-1770, and I recently added a "perfect world" target (calculated using Fibonacci wave extensions) of 1765.33. 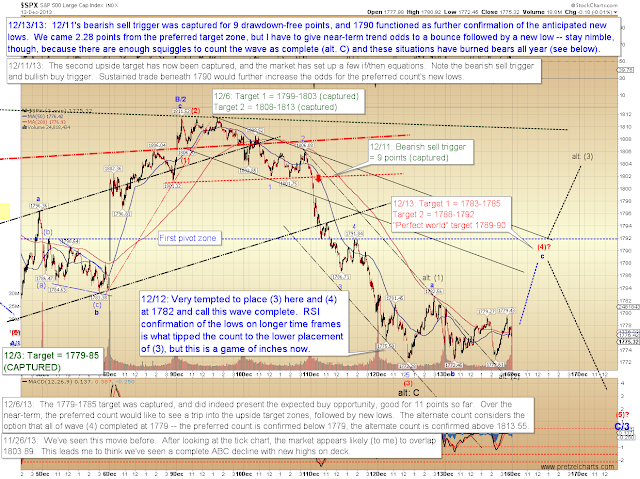 Though I'd still like to see that zone reached, 1772 is acceptably within the margin of error for that target. We're simply going to have to see how things play in the cash market to start off the week, in order to add or subtract confidence to either view. It's also worth mentioning that the 50 day moving average on the S&P 500 (SPX) currently crosses 1761.74, so one more thrust lower in cash would likely make prices a bit more attractive and pull in some additional buyers. Essentially, we're still picking nits here on time frames. Near-term, I'd prefer to see another thrust lower into the target zone, though it isn't required. 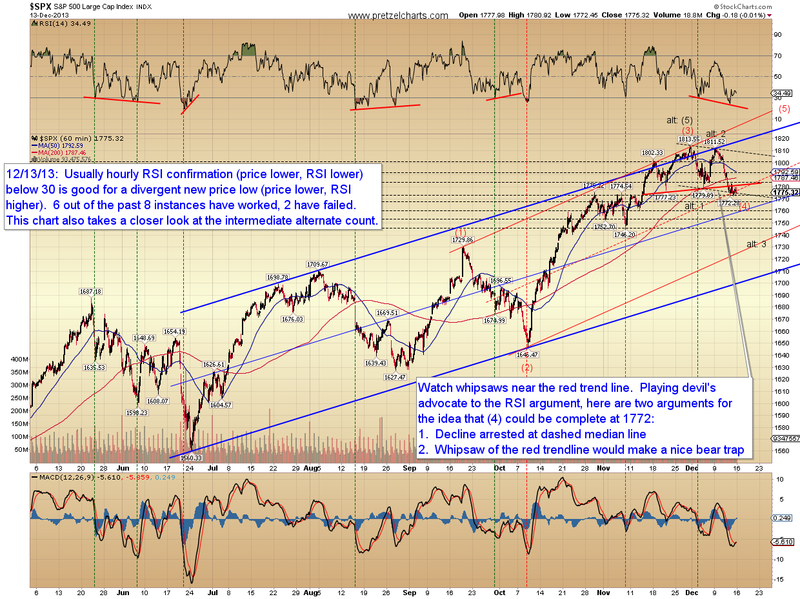 Intermediate-term, I'd like to see a run to the upside target of 1825-40. The bottom line is: Assuming this wave doesn't mutate into the more bearish alternate count, then we'd expect the fourth wave will find a bottom soon, most likely during the first half of this week. If all preferred wave counts play out across all wave degrees (to be fair, that's basically asking for perfection from my work, which is something I'm rarely capable of), then we'd see another wave down over the near term, followed by a recovery and final rally into the wave v target zone, followed by an abrupt peak and decline. Purely from a market psychology standpoint, a move like that would really create the feeling of a whipsaw market, along with mass confusion. None of the arguments presented Friday have changed, nor have the charts. 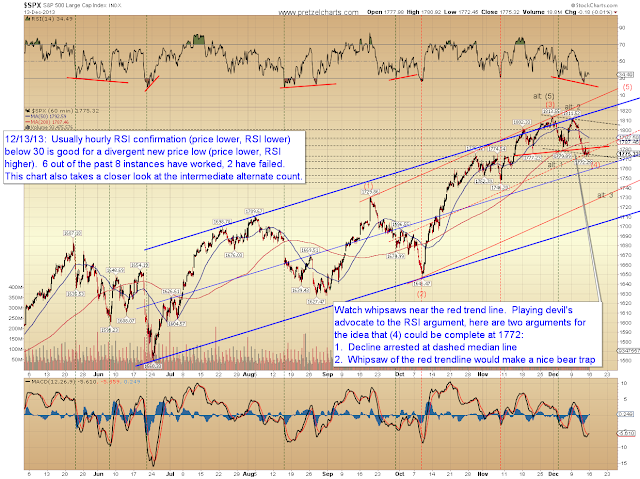 RSI still gives the odds-on favor to a new low (near-term) with a positive divergence. This has nothing to do with wave counts, it's purely based on historical performance. The 3-minute chart is also essentially unchanged. At first glance, one might suspect a triangle here -- but upon closer inspection, the structure violates Elliott Wave rules for a triangle, since the last wave (which would be labeled "wave e" at 1779.43) exceeded the price high of the wave which would be labeled "wave c" (1779.27). Friday's action left the preferred near-term path open, since 1772.28 held both of the session's declines. In conclusion, there's been no material change since Friday. This is perhaps an overly-bold call, but I'd still like to see a near-term rally to the above-noted targets (on the 3-minute chart), followed by a near-term decline to 1760-70, followed by an intermediate rally to the 1825-1840 target zone (the decline and beginning of an intermediate rally would be a nice setup for "Turnaround Tuesday"). The near-term alternate count is that wave C bottomed at 1772, while the intermediate alternate count is that a more bearish leg is underway. To this point, the market hasn't done anything unexpected to cause us to favor an alternate view -- but the market always reserves the right to do so at a moment's notice. As the next few sessions unfold, the charts should provide us with some new patterns and key levels, which I'll update as needed. Trade safe.